GORUCK is a company that makes several products targeted to “rucking” – which is walking or hiking for distance with a loaded backpack. The GORUCK GR1 backpack is their main product. It’s a tough, versatile, and good looking backpack that is considered a premium product. Rucking is the foundation of Special Forces (SF) physical training, so you’d expect this backpack to be too “tactical” for Every Day Carry (EDC), but that’s actually not the case. One of the things I like about my GORUCK GR1 backpack is just how versatile it is – and it fits into nearly any setting – whether on the ruck march, in the field, or in the meeting room – or any other business setting. Let’s talk here today about using the GORUCK GR1 for business travel. We’ll be talking specifically about the GR1 26L version – which has 26 liters of capacity. GORUCK also offers a smaller 21L model. First, let’s highlight some of the key features of the GORUCK GR1. There is a so-called “bomb-proof” laptop compartment. This is on the back of the bag and has a zipper that opens up the top and side of the bag. You an comfortably fit any size laptop here – including a big 17″ laptop. The GORUCK GR1 has a laptop compartment, this is the view from the back and the shoulder straps are flipped around for easier access to the compartment. The GR1 also has a false bottom – so your laptop won’t be resting directly on the bottom of the bag. This helps protect it from damage. 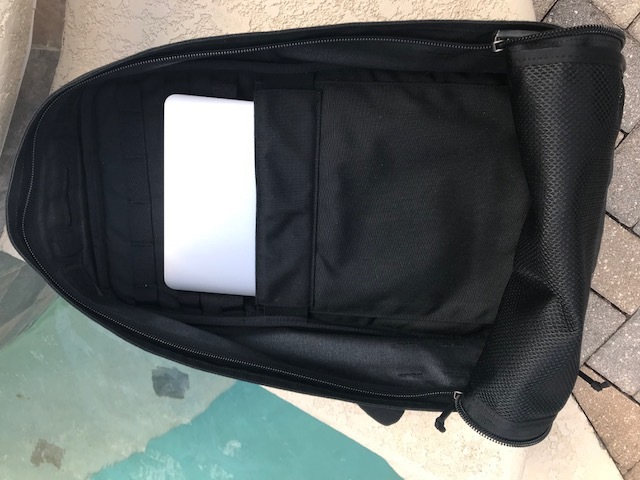 There’s also an integral “frame sheet” within the back of the bag – this adds rigidity and is mostly intended for fitness purposes , but I think it also helps protect the laptop, and it makes this bag more comfortable when loaded heavily. But that’s not your only option for safely transporting a laptop in the GR1. There is also an internal pocket with strong elastic that is intended for “ruck plates” – specially shaped weight plates used for the fitness training aspects of rucking. But, this is the perfect place for a 13″ laptop or notebook. My 13″ Macbook Pro fits flawlessly in this pocket – and that’s where I prefer to carry it. It’s also a great place for an iPad or other tablet. The inner elastic pocket can fit a 13″ laptop, such as the 13″ Macbook Pro seen here. The top is secured with elastic but I wouldn’t recommend carrying the bag upside down in this case! I often carry two laptops – one issued by work clients, as well as my personal laptop – and the GORUCK GR1 does that well. It’s also rainproof – so you don’t have to worry about getting caught in a short rain storm or rain shower. This is not your average laptop bag – not by a long shot. It’s not overloaded with sleeves, compartments, and zippered pockets. It’s actually much more like a suitcase. GORUCK GR1 – opens flat and has lots of space – you figure out the best way to use it! This is an advantage rather than a drawback. For one, it makes the bag that much more versatile. You can determine how you want to utilize the space within – rather than being stuck with a bunch of “sub-divided space”. Need to pack an extra pair of shoes and a thick jacket (in addition to one or two laptops)? Not a problem. This is a “lay flat” bag for packing. You lay it flat and open the zipper, and you can efficiently pack all your gear, clothes, or accessories. And while it is more akin to a suitcase than other backpacks it still has some built-in storage. It has a front zippered pocket (slant pocket). This is your go to option for car keys, ID badges, wallet, boarding passes or smart phone. This zippered pocket on the front is easy to reach when on a plane, and the 26L fits under the airplane seat with ease – even on the smaller regional carriers such as Allegiant or Spirit Air. The only thing to note about the external pocket – anything packed in there is subject to quite a bit of pressure. It’s a tight fit – if the bag is packed full. I wouldn’t put sunglasses or reading glasses there. But I’ll tell you where they should go. The GR1 also has an interior zippered pocket at the top of the bag – this is the perfect place for sunglasses and reading glasses. Below that, there’s also a larger zippered mesh pocket – great place for chargers and other accessories. An iPad will also fit in the mesh pocket. We already mentioned the “plate pocket” with the elastic reinforcement – perfect for a 13″ laptop or notebook. The GORUCK GR1 has MOLLE (Pronounced “molly”) webbing on both the outside and the inside. MOLLE is rooted in the military, so it’s an acronym, of course. Technically this webbing is known as the MOLLE (Modular Lightweight Load Bearing Equipment) PALS (Pouch Attachment Ladder System) webbing. It’s heavyweight nylon webbing stitched onto the backpack. And this is how you organize and customize further this backpack. There’s a huge variety of MOLLE pouches, bags, “admin” panels, and all sorts of other things that can be secured to the bag (inside or out) thanks to this. And how do you attach these pouches and accessories? Using a variety of MOLLE clips. And so, while the GR1 is like a big empty suitcase, we can customize or add more capacity through the MOLLE. Don’t like the fact that the GR1 gives you only one externally accessible pocket? Add a MOLLE pouch on either side, or the back of the bag. There are 3 rows of MOLLE on both the sides and back. Need to better organize the interior? There’s 3 rows of MOLLE there as well. And, depending on what you need on the inside you can actually buy a “Rigid MOLLE Panel” on Amazon and extend the MOLLE for the entire height of the bag. The other thing that really stands out about the GR1 – it has luxuriously thick and padded shoulder straps. GORUCK GR1 – best shoulder straps ever? I think so. Really, these are heavenly. You have to experience them to understand fully. They are really wide – which helps distribute the load. Secondly they are made with some sort of internal closed cell foam of some sort. The padding is very nice. Lastly, I love the way the pack feels on my back with the internal frame sheet. The rigidity is nice. OK. At this point you might want to ask – it’s a laptop bag that can fit 2 laptops and it’s got MOLLE. There are other (cheaper) options. Yes, but GORUCK has struck the perfect balance between tough, functional, and stylish for ANY environment. The GORUCK GR1 in black doesn’t look out of place in the meeting room or on the airplane. There’s MOLLE, but not too much MOLLE. If you want or need the tactical look they’ve got Multicam and other camouflage patterns. But they also have options that don’t look military – black, wolf grey, ranger green, and more. There’s also a velcro patch area – which quite frankly is a lot of fun. You can easily change or remove patches based on the business setting. These bags have a lifetime warranty, known as SCARS. Basically they will replace or fix any manufacturing defect for the lifetime of the bag. But, these bags are tough. Made from 1000D Cordura you’d be hard pressed to damage these in most normal business and urban settings. Isn’t 1000D Cordura stiff, abrasive, and heavier than 1050D Nylon? Some people have noted that it can cause piling on some shirts. Overall it’s not been a problem for me. How does it fare against suit jackets? I don’t know as I have blessedly not needed to wear one on a regular basis in quite some time. You can always carry it via the top handle, if you don’t want to wear it as a backpack. Why are the GORUCK bags so expensive? OK, here’s the thing. The GORUCK bags are not cheap. Made in the USA – and their founder readily acknowledges this means their products cost more. And lastly, GORUCK is a premium brand. It’s a good looking bag too. What’s the cheapest way to get one? Well, you can look for a used one for sale on reddit. If you are an active student, LEO, military, and other forms of first responders they offer a 25% earned service discount. And lastly, they have sales pretty frequently. Your next best bet for a big sale on GORUCK gear? GORUCK Black Friday 2018. Other than that – you could look at the different models and sizes. The Rucker 2.0 bag is cheaper than the GR1 , but it’s not available in 26L size (21L) only, has no internal MOLLE, and no laptop compartment. I don’t know if a 13″ laptop will fit inside. How Does GORUCK GR1 Compare to the 5.11 Rush12 Backpack? For a budget bag of similar size, the 5.11 Rush12 backpack isn’t bad. The biggest hang up for me is that it looks too “tactical” for the majority of settings I’d take it to. Secondly it’s not a lay flat, “suitcase” style backpack. But, if you are looking for something else, the 5.11 RUSH backpack series ain’t bad at all. The GORUCK GR1 is an awesome laptop bag for business travel. I do recommend you get the optional chest strap (sternum strap). The chest strap lets you tweak how the shoulder straps lie on your body – and this is a great fatigue reducer when walking a distance. The chest strap connects to the MOLLE on the shoulder straps so you can take it off and stow it in the bag, if you want. I’d also recommend a set of packing cubes for internal organization of the bag. There are a wide variety of these on Amazon – small zippered bags, usually with mesh on one side so you can see the contents easily. Grab a set of two or three and you have options. Lastly, you really do need some sort of “admin pouch” or “admin panel” if you want to organize pens, flashlights, multi-tools, and other small gear. Do I wish the bag came with that? No – because I’d rather choose how to pack that most efficiently. Most every other laptop bag I have has a huge amount of unused storagein this regard. Let me decide how to best store that gear. The GORUCK GR1 is tough, versatile, and looks good. It can be used as a fitness implement for “rucking”, but it is also right at home as a business traveler’s or commuter’s main carry on item.